Silver brocade ribbons; magic wheel. ABSTRACT DIGITAL ARTWORK. A complicated image formed from "ribbons" in brocaded silk and damask. The central wheel has a center in grey and white on a black background patterned in gold; surrounding it are radiating ribbons in glossy silk with a pattern of dark grey on silver. The ribbons loop into an outward rim of luminous silver with edging of gold and white. Complex design; elegant minimalist color scheme. DIGITAL ARTWORK. This series produced some of the most unusual, and certainly the most 3D abstracts I've made. It's very detailed and the colors are lovely if you like shades of peach or tangerine. 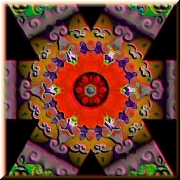 A three dimensional peach-colored mandala with a central flower in soft vermilion "felt." Details in pale green, pale lavender, with very faint touches of pale pink. It appears to be made from moulded plastic substance and has many lacy and flowery details. I prefer the larger images for tiling; the smaller ones create too busy an effect (though I use them to decorate my blog entries). DIGITAL. Two woven "leather" wheels in subtle colors. The first is in shades of teal, pale green, rose, periwinkle, and bronze on a silvery background. The second is in shades of teal, forest green, blue, and purple. Silver and dark blue mandala. 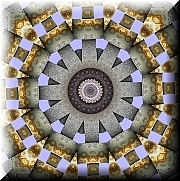 DIGITAL MANDALA. A dark blue and silver chrysanthemum within a ring of very dark blue fabric with gold accents, surrounded by a jigsaw silk pattern in silver and dark blue. ABSTRACT DIGITAL ART. A soft golden wheel with a soft golden center, surrounded by a mottled gold and black background. DIGITAL ARTWORK. A mandala carved from tan and gold stone with a dark green center containing a pretty blue periwinkle---and surrounded by periwinkles. The flower is really a beautiful color, somewhere between purple and indigo. Blue and white ribbon mandala. DIGITAL MANDALA. A blue silk ribbon mandala in royal and cobalt blue with white and aquamarine details. ABSTRACT DIGITAL ART. A mandala in pinkish-purple stones surrounding a central star in silver; linked together by a ring made from bronze and pale purple stones. The entire image is surrounded by a metallic frame in old gold. Crude and clunky, yet compelling in its way. FLOWER MANDALA. 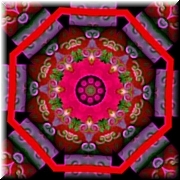 Flower mandala in orange, tangerine, lavender, and purple on black background.